I veganized my friend’s Nishi’s lentil salad, and replaced some veggies with what I had in the fridge. Mix all the ingredients, and add dressing. Even my omnivore husband enjoyed this salad! 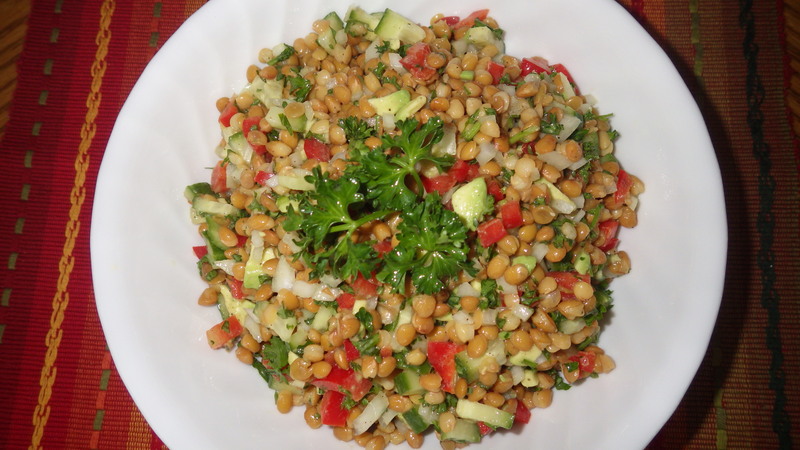 For vegetarians, below is Nishi’s original lentil salad recipe. This is one of our favourite desserts to make for the holiday season. We like to serve these on Christmas Eve but they are a welcome addition to any occasion! 2013 will bring a new healthy lunch feature to the blog to balance out all the desserts we’ve been posting! Hope you enjoy the holidays! 1. In a large bowl, beat eggs and sugar until creamy. Gradually add butter, milk and vanilla, and mix well. 2. In a separate bowl, sift flour and stir in baking powder. Add to the egg mixture and fold in with a spoon until well blended. 3. Pour into a greased and floured 9×13 inch pan. Bake at 350 degrees Fahrenheit for 25 to 30 minutes. Let it cool for at least 20 minutes and then cut into squares. 4. Meanwhile, bring milk and sugar to a boil. Lower the heat to medium low, and gradually add the chocolate, stirring constantly until it’s melted. Remove from heat and add butter. Stir until the butter is melted. 5. Set up the ingredients to form a sort of assembly line on your countertop. Place the pan of squares and the chocolate mixture next to each other. Evenly spread the unsweetened coconut on a plate and place it last. Take a square from the pan, gently dip each square into chocolate mixture and then roll in coconut. Make sure each square is completely covered with chocolate before rolling in coconut. Arrange squares on a big platter or in a plastic container. Put either foil or wax paper between the rows. Cool squares in the fridge for 12 hours, or in the freezer for 4 hours before serving. I love the idea of giving friends and family something a little more personal and heartfelt for Christmas in addition to store-bought gifts from their wish list. It’s easy to reuse fancy jars, glitter and Christmas ornaments laying around the house for a quick and easy homemade Christmas present or stocking stuffer! Materials: Small reused jar, old Christmas ornament, glitter, baby oil and super glue. 1. Find a small jar and fill it up with baby oil, which will make the glitter fall slower. Fill the jar to the brim as much as you can. 2. Add a teaspoon of glitter. 3. Find a small Christmas ornament, remove the rope that is used to hang it on the tree, and add super glue to the bottom of the figurine. Hold it steady on the jar cap for at least a minute, and then let it sit on the super glue for a few more minutes. Once the super glue is dry and the figurine is stuck securely to the cap, flip it upside down and screw it to the jar. Materials: reused jar, ribbon, Christmas card and dry ingredients from a cookie recipe. 1. Use our peanut butter chocolate chip cookie recipe for this one! Layer the dry ingredients in a clear jar. 2. Write out the recipe on a Christmas card, noting that all they have to do is mix together any wet ingredients in a bowl, and then dump the contents of the jar and mix. 3. Attach the recipe to the jar with a ribbon. This smells like lemon cake. Need I say more? Materials: One cup sugar, half cup vegetable glycerin, one tablespoon grated lemon zest, a small reused jar, Christmas card and ribbon or bow. 1. Mix one cup sugar, half a cup vegetable glycerin and one tablespoon grated lemon zest in a small bowl until mixture is smooth. 2. Pour into a small jar and attach a small Christmas card and ribbon or bow. Don’t have vegetable glycerin? Use olive oil. Leave a note attached to the jar cautioning the recipient to wipe off the bathtub floor as oils are slippery. This is an excerpt from an article I wrote for The Reflector. Check out the full article here. It’s the holiday season and we’re in the mood to bake! These peanut butter chocolate chip oatmeal cookies are soft, rich and gooey. I even managed to sneak a carrot into these cookies! If your’e allergic to peanuts try almond butter. Or chocolate almond butter. Mmmm. 1. Preheat oven to 375 F and line a baking sheet with lightly greased aluminium foil. 2. In a large bowl whisk together the flour, rolled oats, baking powder and salt. Add the shredded carrot and mix together. 3. In a separate bowl use a whisk to combine the maple syrup and nut butter. Add this to the flour mixture and stir until combined. Stir in the chocolate chips. 4. Drop about a tablespoon at a time onto baking sheet. Leave at least an inch between each cookie. Bake in the top 1/3 of the oven for 8 – 12 minutes or until the cookies are golden on top and bottom. For a softer cookie you’ll want to bake it for about 8-10 minutes. 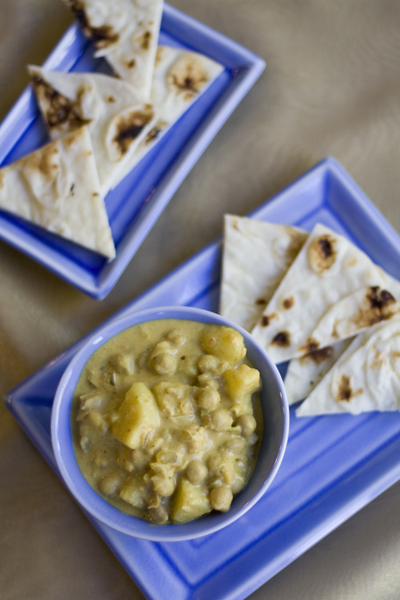 My recipe originally published on The Calgary Journal food blog. We love fusion foods in our house! This one was easy. By using miso as the primary seasoning, this Eastern European soup is given a Japanese twist. The fusion results in a satisfying richness. 1. First make a roux, a basic thickening agent, by combining equal amounts of olive oil and flour. Heat oil on high in a large pot. When oil is hot, turn heat down to medium. Add the flour gradually and stir constantly. It should be smooth with no lumps. Keep stirring until the flour is light brown. Make sure it doesn’t burn. 2. Remove from heat and add the water. Be very careful not to splash yourself as the roux will be extremely hot. 3. Add potatoes and bay leaves to pot. Cover the potatoes with salted water. Bring to a boil and simmer for 25 to 30 minutes or until the potatoes are soft and can be easily pierced with a fork. 4. Remove soup from heat. Take out the Bay leaves and discard. Use a potato masher to combine the miso with the potatoes. 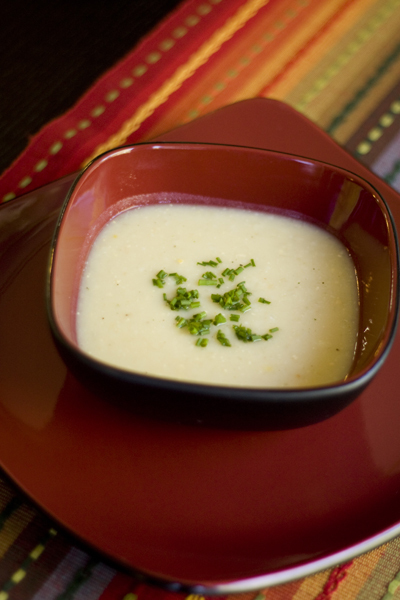 Mash until soup is thick and creamy. 5. Add vegeta, salt and pepper. Taste soup and see if you would like to add more seasonings. 6. Sprinkle each serving of soup with fresh chives. 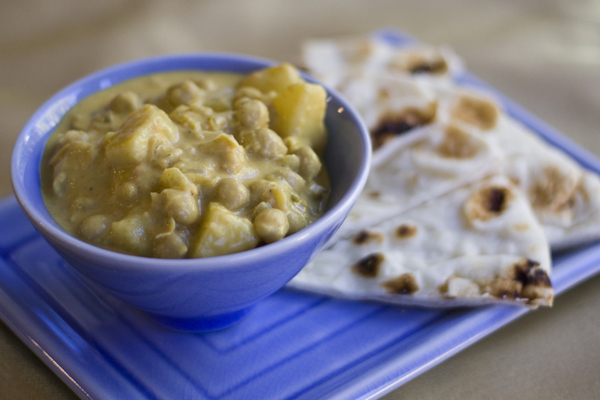 What are your favourite fusion foods? We love curry, but prefer to create our own blend of spices. 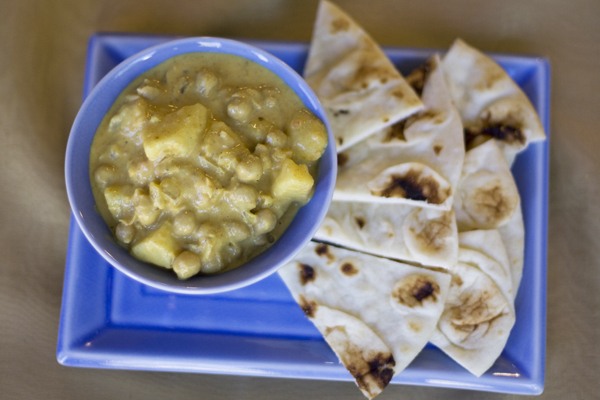 Paired with the coconut milk, they help create a fiery yet sweet potato curry. If you like your curry really hot, feel free to amp up the cayenne pepper! 1. Place peeled and chopped potatoes into a medium-sized pot. Cover potatoes with salted water. Bring water to a boil, then reduce heat and simmer for 15 minutes until potatoes are tender. Drain. 2. While potatoes are cooking, heat olive oil in a large skillet over medium heat. Saute onions in oil until translucent, about 5 minutes. 3. Add garlic and saute for 2-3 minutes. 4. Add the salt, pepper, ginger, coriander, cumin, turmeric, garam masala and cayenne pepper. Cook for 5 minutes. 5. Add the potatoes and chickpeas. Sir in the tomato sauce and fresh lemon juice. 6. Add coconut milk and allow curry to simmer for 10 minutes. 7. Taste curry and add more garam masala, cayenne pepper, salt or black pepper if desired. Like this recipe? Subscribe on the right to get links to FREE recipes right in your Inbox! Originally published in Culinaire Magazine. 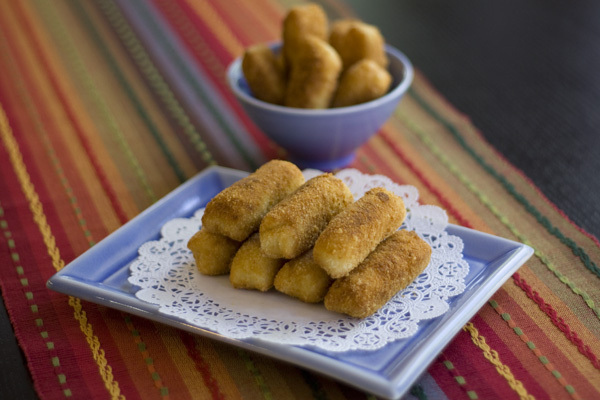 Croquettes, or “kroketi” if you are Croatian, are small, deep-fried rolls usually made with potatoes that can be filled with anything you’d like. We’re obsessed with double-smoked cheddar cheese and will find an excuse to put it in any dish, but feel free to add veggies like onions or mushrooms. The possibilities are endless! Consider making these crispy, delicious rolls as a snack the next time you have leftover mashed potatoes! If using leftover mashed potatoes, skip steps 1-3. 1. Peel and chop potatoes. Cook potatoes in salted, boiling water in a medium-sized pot for 30 minutes. When potatoes are soft enough to be pierced with a fork, strain and return to pot. 2. Add margarine and milk to potatoes and mash until smooth. 3. Let mashed potatoes cool until they can be handled. 4. In a large mixing bowl, combine the mashed potatoes, egg yolk, flour, salt and grated cheese. Mix by hand until smooth, then roll out mixture into a long log. Cut log into small rolls that are approximately 2 cm thick and 4 cm wide. 5. Set up a breading station. Beat remaining egg into a small bowl and place the breadcrumbs on a plate. 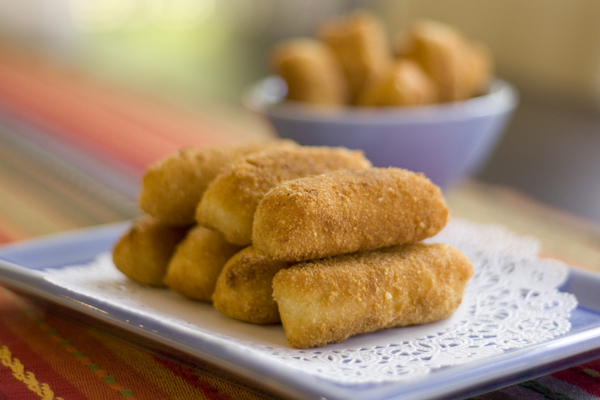 Dip each croquette into the egg mixture, then roll through breadcrumbs until croquette is well covered. 6. Heat canola oil in a large skillet. 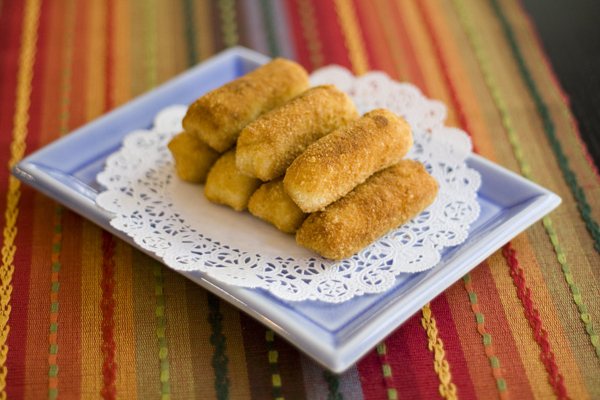 Fry each croquette in oil until brown on both sides, about 4 minutes of frying on each side. Fry in small batches, cooking about eight at a time. Do not overcrowd pan. Enjoy with Ajvar, a red pepper spread! Want free recipes delivered to your Inbox? Subscribe on the right! Recipe originally published in Culinaire Magazine.